A thank you to wetcanvas.com for the reference sharing they do. I used two photo references for the above painting. Took me some time; this one did. I was bound and determined to get this barn down the way I saw it. 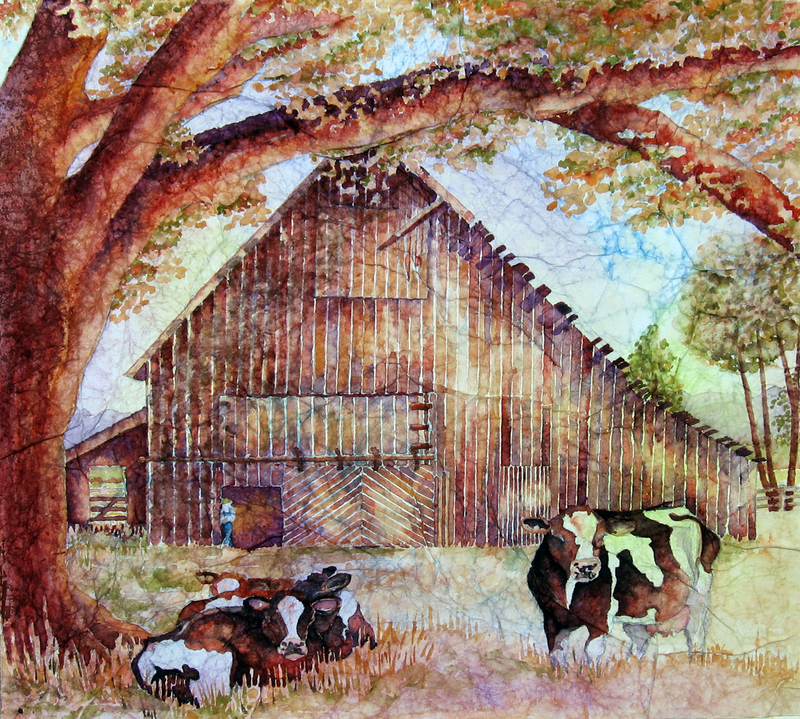 The barn and the cows are from two different photos. I thought the barn , by itself, might look too plain or flat or static, somehow. This is another painting on masa paper (tutorial here). Carol King has completed her first two paintings on masa paper here and here and doing a fantastic job with it! I have decided to spend some time with my favorite surface which is toned masa paper. I really enjoy watching a painting come to life on this beautiful paper. I never know what it is going to look like and am always intrigued with how the colors I choose play across its surface. Each piece of toned paper poses new considerations for the artist. Because I brush a thin layer of the matte medium glue over the top surface, I also have some lifting properties with it. (see tutorial on how to tone and affix masa to watercolor paper here and here. I draw right on the surface of the crinkled masa paper to begin. The initial steps of applying the paint can feel quite different from painting on watercolor paper. The first challenge is that the artist sees all this toned paper with dark threads running through it. It is difficult to see the pencil marks. Combine that with a surface that does not receive the watercolor pigment in the same way watercolor paper does. 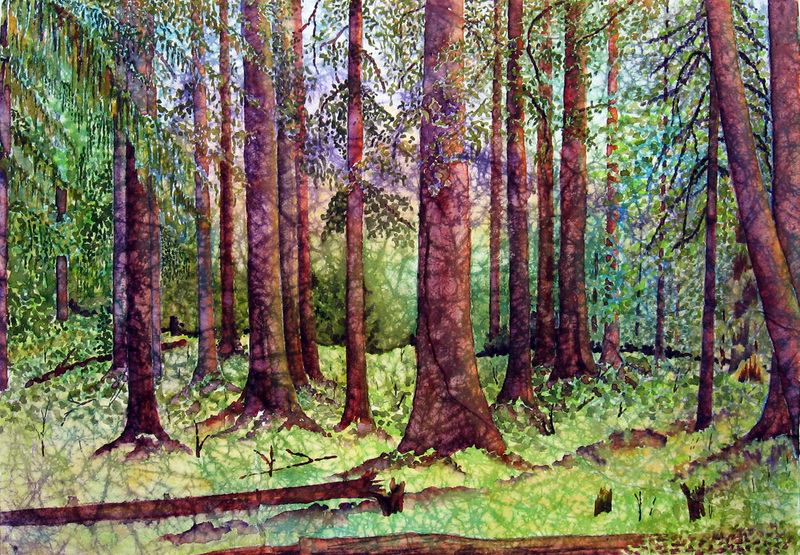 Large wet-in-wet washes look completely different on this surface because the flow is interrupted by the wrinkles as well as the porosity of the paper. Edges can be softened, still, by tickling the hard edge with a damp brush, but it looks different on this surface than on watercolor paper. Above is my start with this particular painting and I think it gives the viewer a good idea of what that start can look like. I could easily become discouraged, right here, as I work to decipher my way through all the color and texture left by the toned paper. What works for me is to imagine that surface as white and paint just as I would begin laying in any watercolor. As I design the surface, the tonal pattern begins to take second stage to the composition taking form on its surface. The tonal color becomes like the white of watercolor paper. The color from the toning does not lift off onto my brush and into the new color being applied. Thus green still looks green when you paint on a red toned surface, etc. If I am going to use any white at all I ALWAYS save that for the last step. I don’t want it running through my other colors and fogging them up. I start my painting by defining something. I chose to define the stream, first, in the above composition. It gives me an area of the painting to work outward from. I needed it to look glassy and having this down helped me to know how much texture I was going to have to get into the foliage in order to emphasize this. 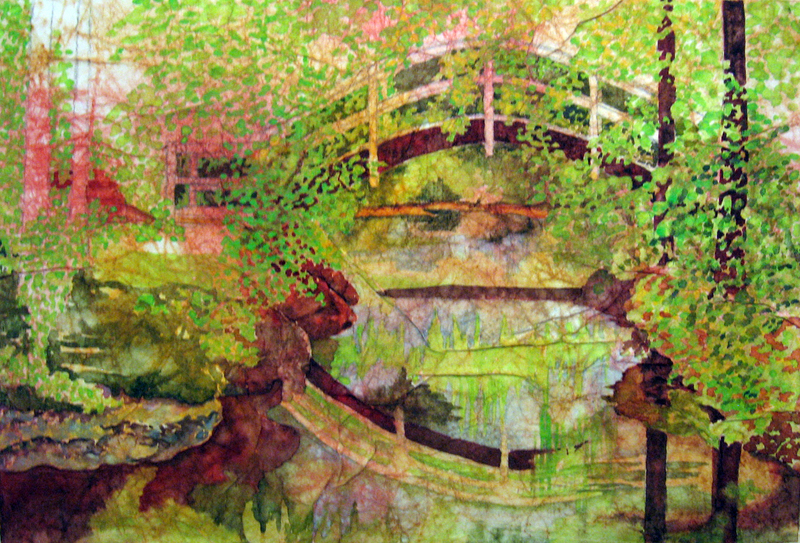 In the next step, I began laying in my lightest colors of foliage on either bank and around and behind the bridge. 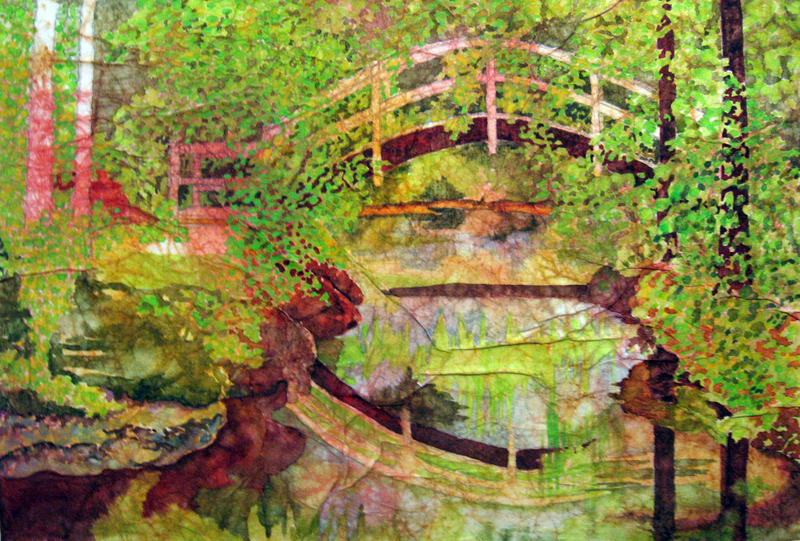 It was important to get that small area of land foliage under the hump of the bridge to read correctly with the reflections in the water. I also spent time defining the left bank. The greens of the grass changed from light green to dark green and I wanted to establish that. By this time, I am on my way and the textures and toning of the masa paper does not bother my eyes any longer. I can clearly see where I am going with the painting. HOWEVER! This rarely looks like my photo reference. The toned paper adds so much to a scene and changes all but its pathway of light and design. Begin to look at what you are painting as “your essence” of the reference material rather than to struggle to make this look like the reference. 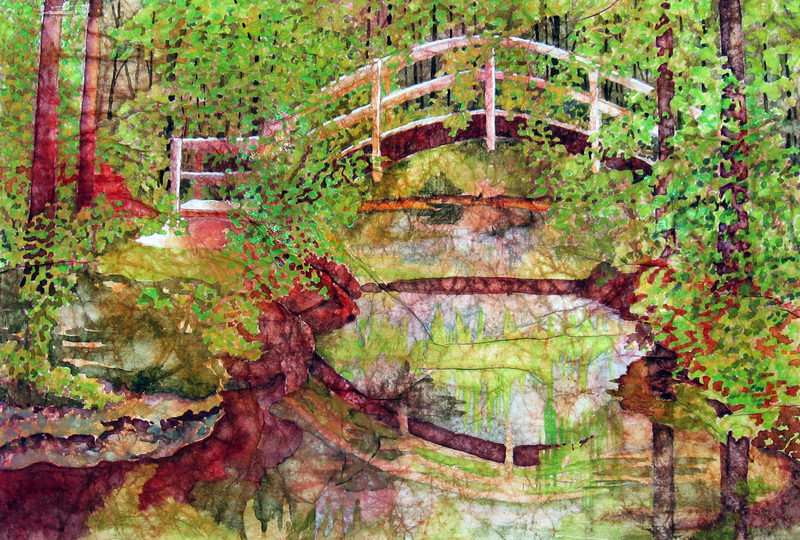 I then began to work in midtones behind all the lighter green and yellow foliage. This takes time and is rather tedious. In finishing I do a lot. I added all the tiny dark tree trunks and branches I saw running through the woods in the background and darkened the tree trunks in the upper left quadrant, first. Then I begin lifting in areas I want the texture of the masa to show through. I lifted the darks on the left bank by wetting a brush and applying water to the surface of areas I wanted to texture. I then lift areas of color out. You can see that the left bank is more textured in this view than the one previous. I also lifted color from the tree tunk reflections in the lower right quadrant. I lifted darks from the reflection of the underside of the bridge in the water. Wherever a dark appears flat, I play with it in this way. I furthur defined the reflections around the bridge in the lower left quadrant and smoothed out the area where it disappears in the surface of the water in the lower right quadrant. I lifted tiny areas of color in the lower lefthand quadrant going up that bank and leading the viewer’s eye to the entrance of the bridge where I added some white gouache. I painted areas of the rails of the bridge in the white gouache to define it. I lifted a little of the darks from the tree trunks in the upper right quadrant so they appeared as though some speckled light was hitting them. To create my darks on masa paper, I always have to use combinations of staining darks. These would be colors like prussian blue, alizarin crimson, hookers green, the quinachridones, aureolin and anything labeled phthalo. Lights are usually the toned colors of the masa paper and midtones are my light and midtone colors of my palette. 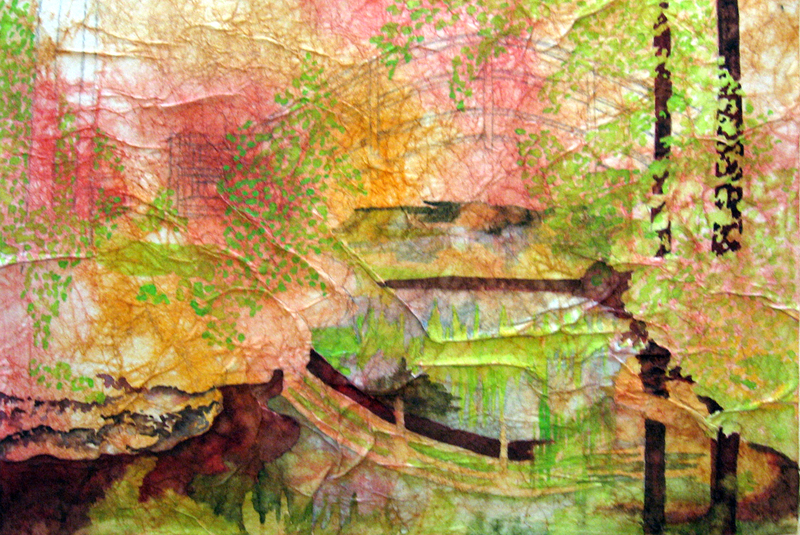 The above painting was done on masa paper that I crinkled, toned and adhered to 140lb Arches coldpress paper. This is, by far, my favorite surface to paint landscapes on. I like the effect of the crinkled and toned paper. If you are interested in trying a painting on this type of surface, I have outlined how to prepare the paper here. There is more info found here and here. Race on over to Al’s!!!!! 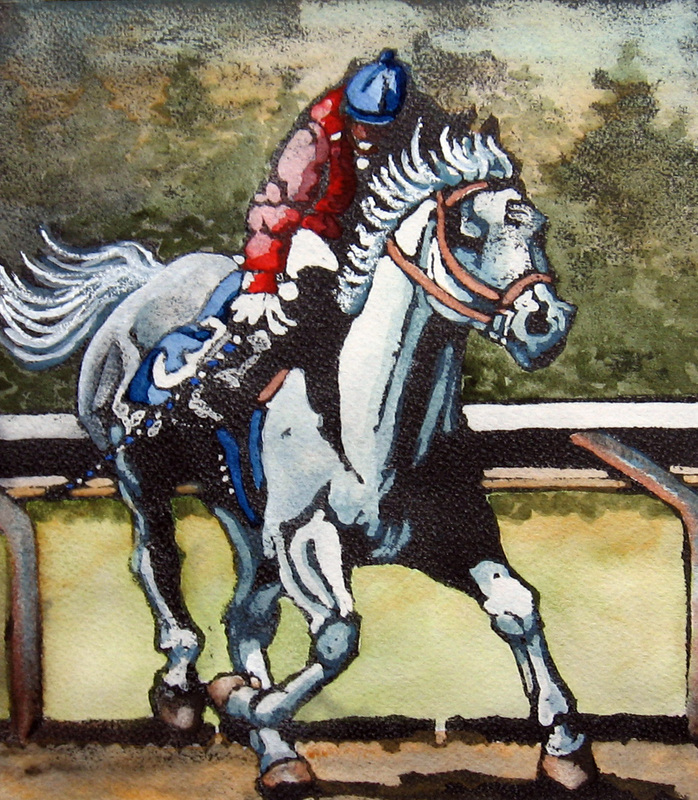 The above art is a gouache resist. PLEASE take a trip over to Artist at Exit O Riverblog found by clicking here. His blog is being featured in an art show at the Kentucky Museum of Art and Craft in Louisville. The show is titled Seven Borders and curated by Joey Yates. A desk top computer is set up on a white table in this show and Al’s blog is on it! Viewers can scroll around on his blog and find out what he is doing. They can also click on YOURS! by visiting the comment section (that is, if you leave a comment). The show is up and running from now until September 1st. What a great way to let people know what we artists are sharing here on WordPress! Al recycles trash and other things he finds washed up on the banks of the river at the Falls of Ohio. He has been posting his work for several years, now. He includes educational posts about the environment and always has a creative story to go along with what he does. His sculptures are always interesting and come complete with a personality. What a wonderful way to include a wide view of art in a show! Clapping for you, Al!